If the custom-made wine cases — and the 12,000 bottles they hold — flanking both ends of the contemporary rectangular room are any indication, Forbes Travel Guide Four-Star Meritage Restaurant + Wine Bar takes its wine seriously. 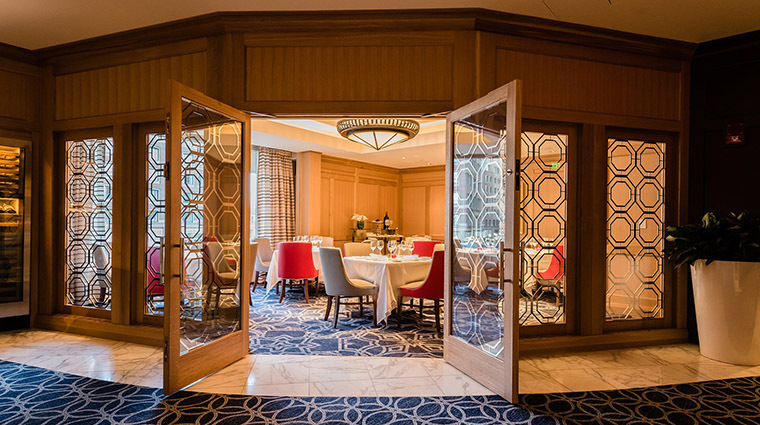 Recently upgraded with a sleek and stylish eye, Meritage now offers a unique vineyard-to-table dining experience, where the art of matching wine with food is done through a menu that simplifies the pairings. A key player at the Boston Wine Festival, the nation’s longest running annual winemaker dinner series, chef Daniel Bruce incorporates local ingredients into his dishes as often as possible. Every menu item, which has unique ingredients to enhance the flavor of the wine, can be ordered as a small or large plate, so feel free to share and taste more than a few. 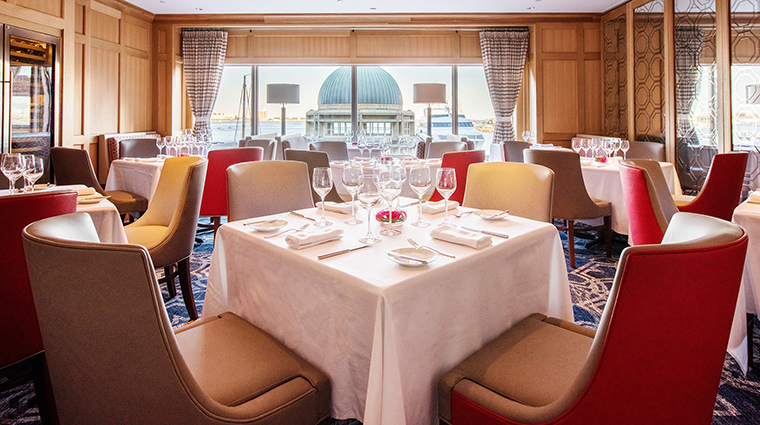 Oh, and did we mention that the restaurant also holds claim to one of the best views of Boston Harbor? 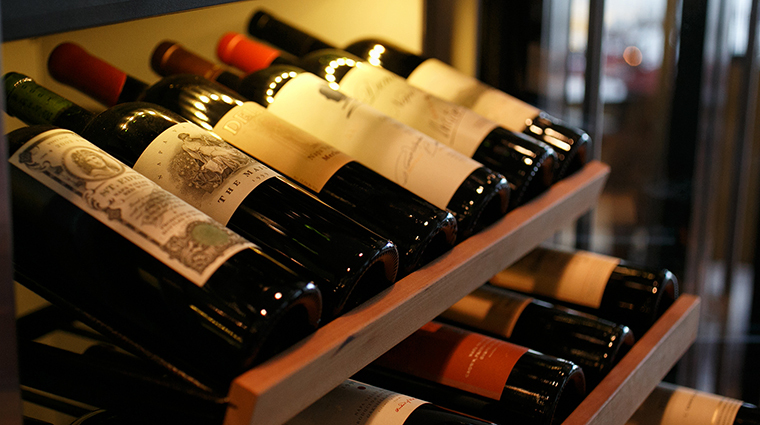 The staff at Meritage is well educated and more than happy to make wine recommendations for your meal. With more than 12,000 bottles of 850 varieties of wine available, choosing a wine can be daunting even if you know your stuff. The Boston eatery bases its entire menu on wine pairings, so if you’re a connoisseur, this restaurant is your new best friend. Wine is an essential part of the dining experience for chef Daniel Bruce, which is why he chooses to make wine such an integral part of the menu. 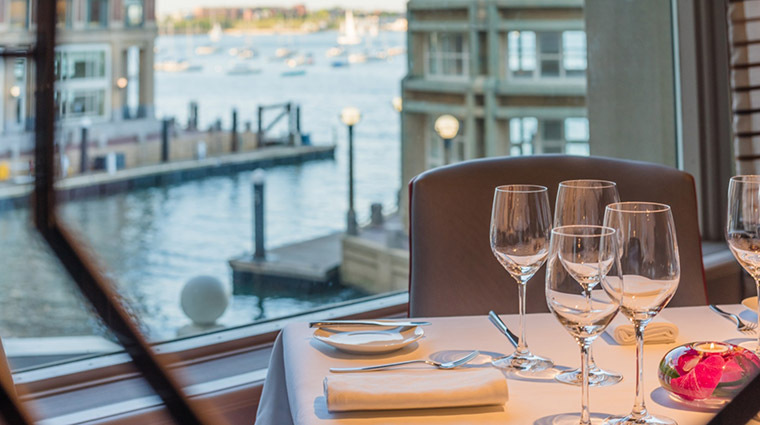 Thanks to its location on Boston Harbor, the Four-Star restaurant offers some of the best views of the historic harbor and outlying islands. Sitting next to the windows is one of the best places to take in the views: see the yachts bobbing in the water and the sun setting over proud Boston. In the summer, you can also take in the live jazz or movies playing on the dock. It’s most certainly a special view, made all the more intoxicating by the great food and wine. Service at the Four-Star Meritage inside Boston Harbor Hotel is gracious and attentive. 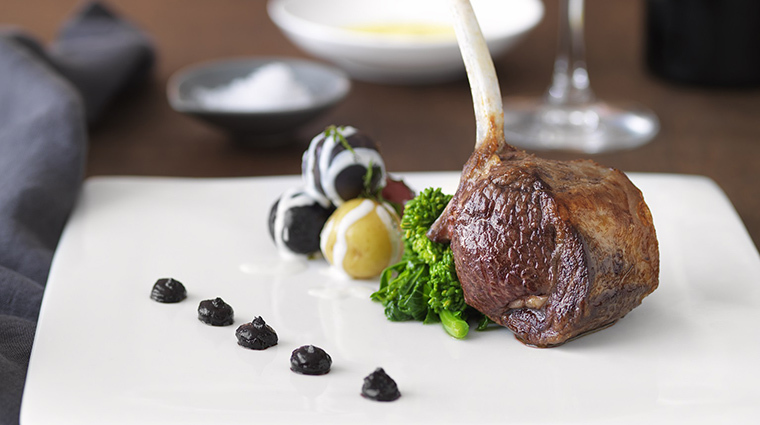 Servers are knowledgeable about the food and wine and passionately make recommendations. 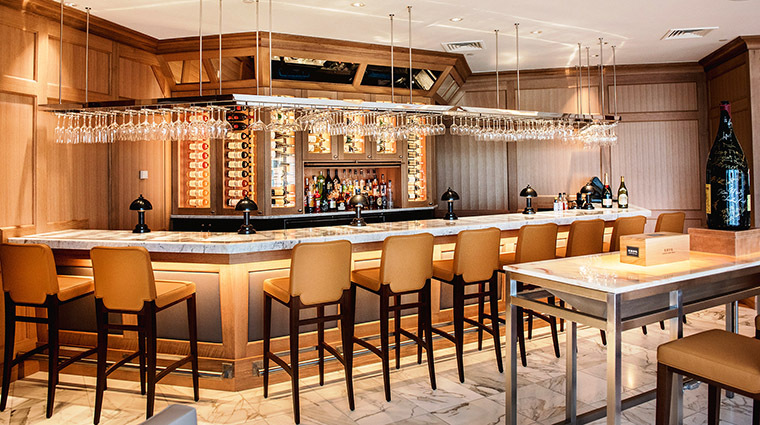 Meritage is located inside the Boston Harbor Hotel at 70 Rowes Wharf. The hotel’s prime location on Boston Harbor combined with its place on the hotel’s second floor makes for some of the best water views in the city. There is no official dress code at Meritage, but its Four-Star nod lends itself to a more dressed-up crowd, so leave the flip-flops and jean shorts at home. You’ll find variations of business suits, cocktail dresses and dressy jeans-and-blouse looks on any given night at the restaurant, so plan your wardrobe accordingly. Meritage is open for dinner Tuesday through Saturday from 5:30 to 10 p.m. The Boston restaurant is closed Sunday and Monday. 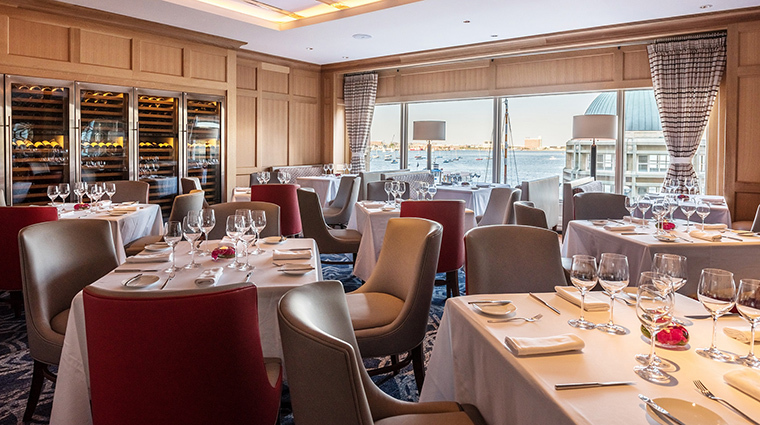 Try to book your table in advance in the summer months especially — you’ll want a table near the floor-to-ceiling windows so that you can check out the live music and movie nights the Boston Harbor Hotel hosts on its deck. Just dial the restaurant directly at 617-439-3995 to make a reservation. The menu at Meritage has a unique, wine-based organization. Foods are grouped into four categories based on the size of the plate (small or large) and the type of pairing (red or white). If you like a certain vintage of red wine, then you’ll have a great idea of which items to order. Or if you know you want a seafood dish, you’ll know which kind of wine to expect the sommelier to suggest. Menu items include oysters topped with caviar, pan roasted New York foie gras and maple and mustard rubbed roast Colorado lamb sirloin. 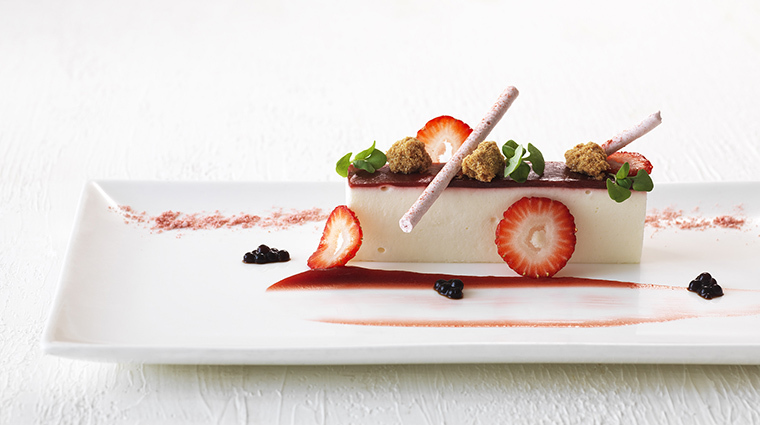 Meritage presents its desserts in “trios” meant for table sharing. The chocolate tasting plate, for example, features treats like a warm milk chocolate bread pudding, white chocolate cream cheese éclair and a dark chocolate nougatine tart. The executive chef at Forbes Travel Guide Four-Star restaurant Meritage, Daniel Bruce, was born and bred in New England, but he traveled to Italy and France for more traditional culinary training. Bruce has plied his craft at the Boston Harbor Hotel for almost three decades. In that time, he’s been awarded the title of Vice Conseiller Culiniaire, Bailliage de Boston, and was twice honored as one of the “Best Hotel Chefs in America” at the James Beard House. Bruce has been a guest chef of the Napa Valley Wine Auction and has made numerous live television appearances. The chef often makes table-side visits throughout the night to check in on his patrons and to ensure that they enjoy their dining experience at Meritage, adding a personal touch to any meal.